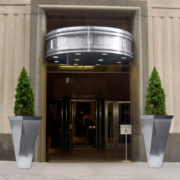 Bask in the look of large metal planters without the weight and cost with ArmoreCoat Real Metal Finishes. With this unique process, the look of real metal fits into any budget. 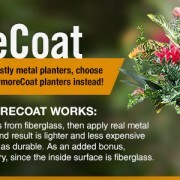 ArmoreCoat real metal coatings can cover any commercial outdoor planter with a beautiful metallic finish so you can achieve the luxe look for less…. 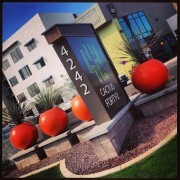 Whether you run a multi-million dollar hotel chain, or a small sidewalk cafe, there is a good chance you have looked for commercial planters for your business. Perfect for both indoor applications in offices, lobbies, and waiting areas, or outdoor spaces like decks, patios, or around entry areas, large planter boxes are a great way to add a little natural beauty to any space.